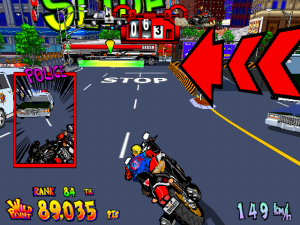 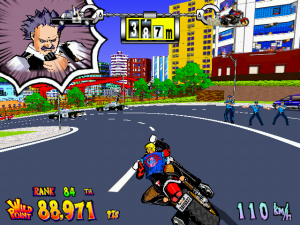 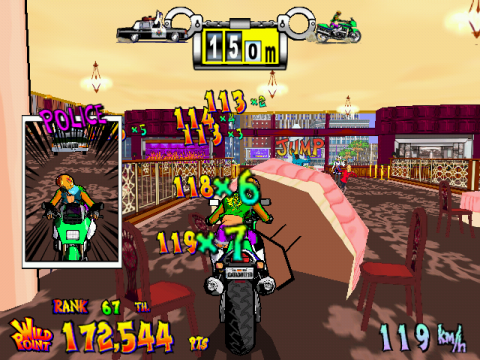 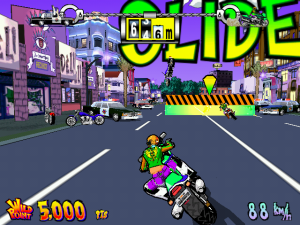 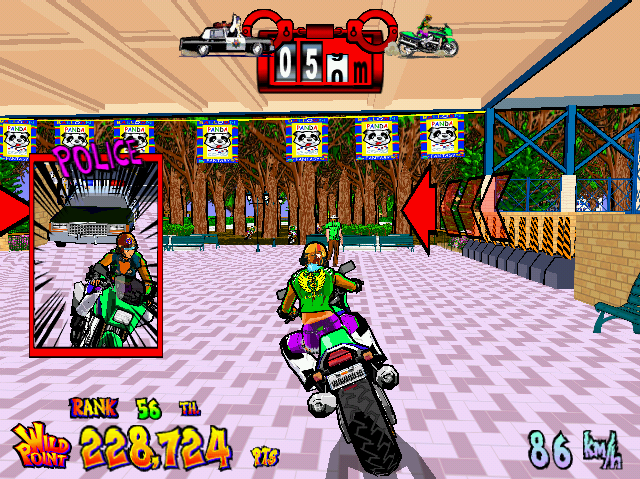 Sega/Wow Entertainments’s Wild Riders is part of the company’s long line of intense arcade racing games, but it’s got a particular visual twist, being something of a modernized Enduro Racer meets Jet Set Radio, with a bit of Crazy Taxi tossed in. 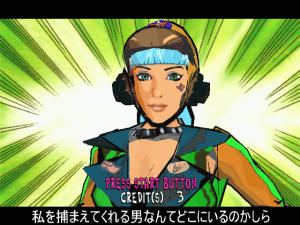 You pick from one of two characters. 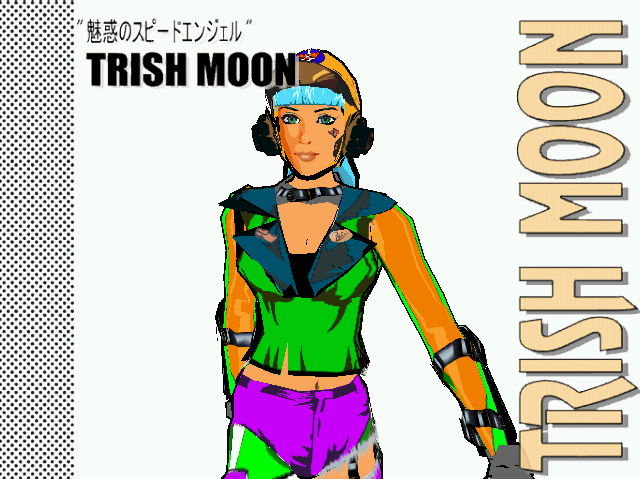 You pick from one of two characters – Keith Raven or Trish Moon – as they make their great escape from some kind of heist, racing through the streets of a suspiciously San Francisco-like city as they simultaneously weave through traffic and avoid the cops. 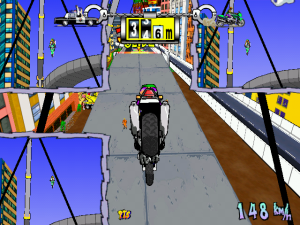 The track takes you from the scene of the crime through a residential neighborhood, over a drawbridge, right into a hotel, into a park, straight through the police station itself, and finally to the docks, where you’ll rocket onto a cruiser and be taken to the safety of international waters. 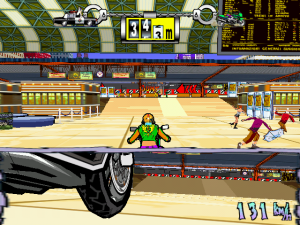 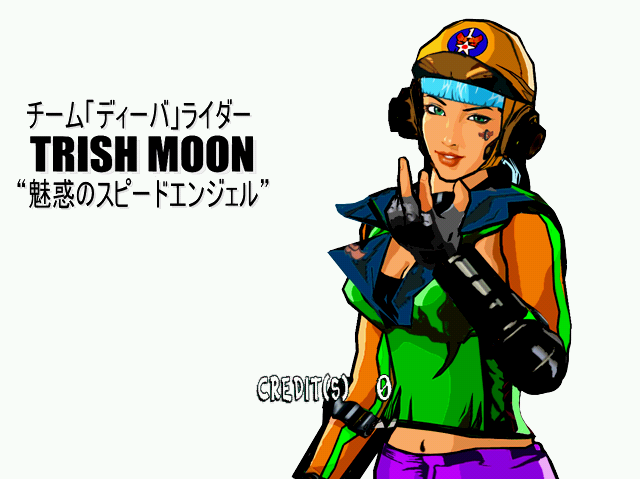 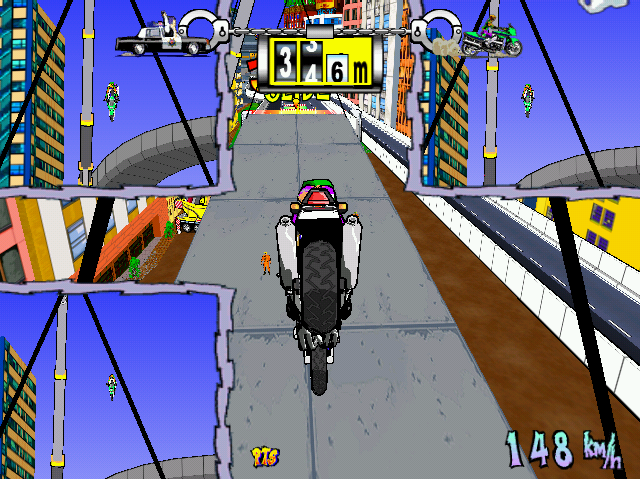 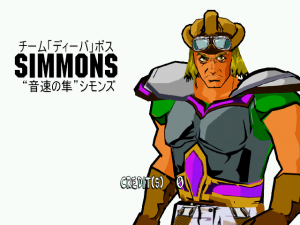 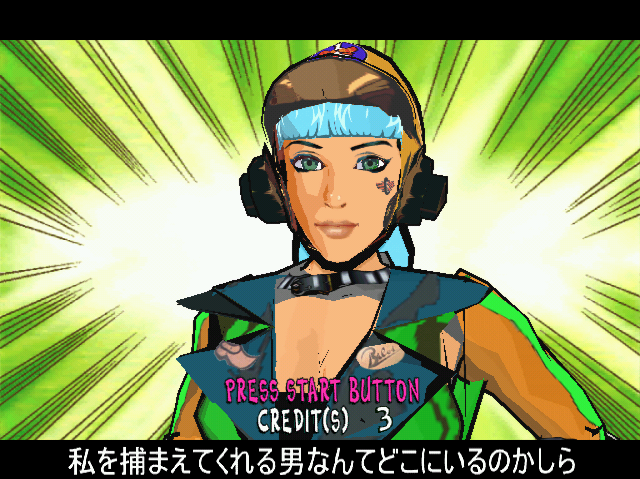 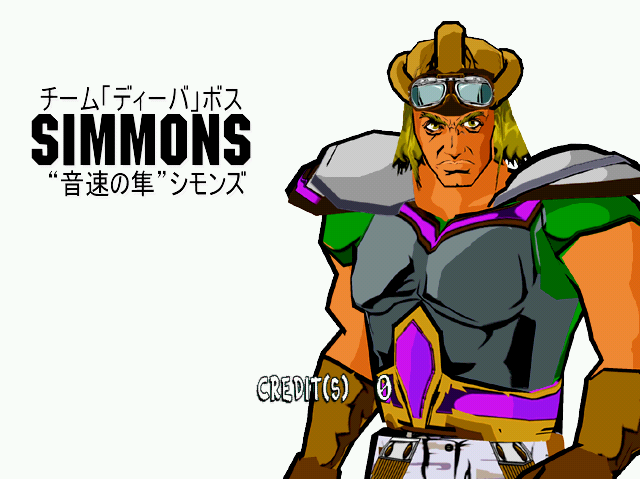 The most immediately striking aspect of the game is its cel-shaded art style, which recalls Jet Set Radio but with more realistically proportioned characters. 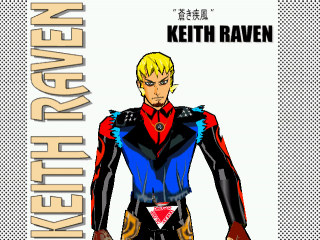 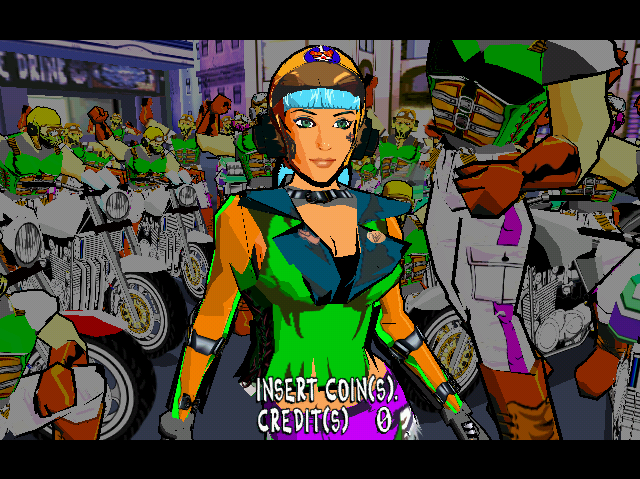 The main characters exude slick punk rock fashion, while the supporting gang members seem to have wandered out of a slightly cartoonish version of Mad Max. 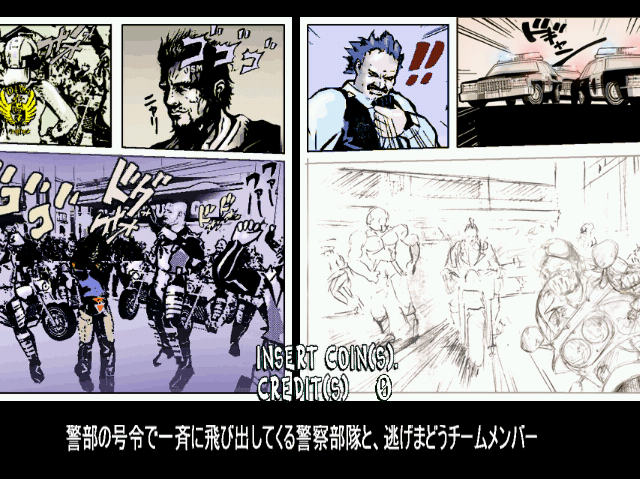 The attract sequence leans into this by presenting the action as a drawn comic book, first as sketches and then fully colored in. 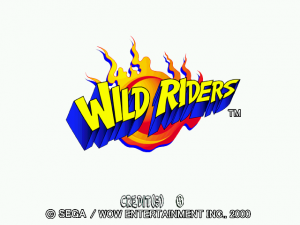 The presentation of contained in every single frame of Wild Riders is stunning. 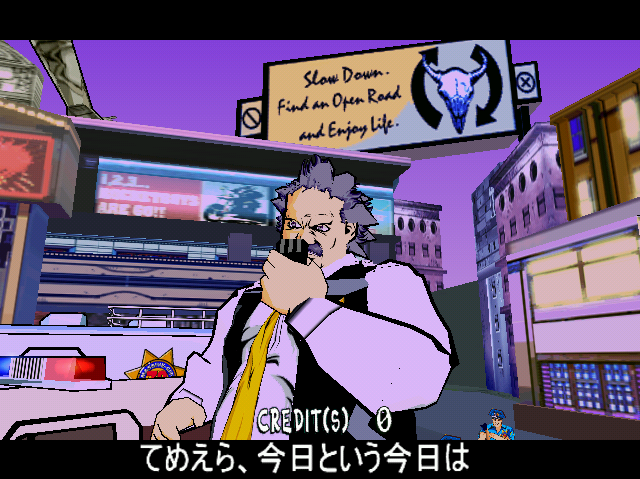 At every climactic moment, and there are many of them in the game’s short run time, there are cut-ins of the action, showing anything from a rear-view of approaching cops, to alternate camera angels, to a close-up portraits of the various characters. 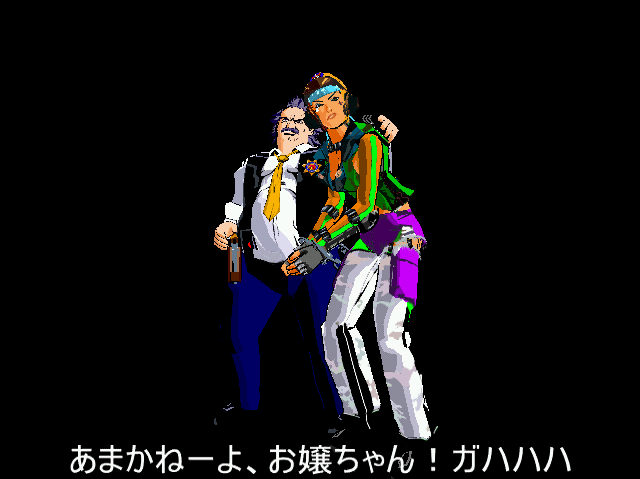 There’s actually a number of friendly and antagonistic characters who are only shown for a few seconds during gameplay, but their presence shows how richly detailed this game world is. 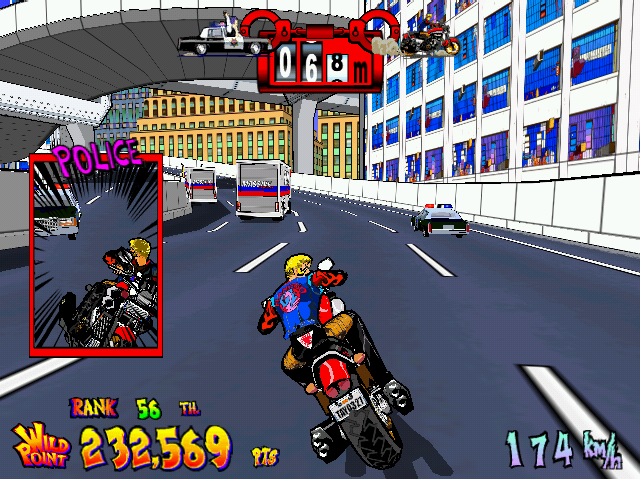 This is coupled with intensity that one would expect from a car chase – you’re constantly weaving between citizens and cop cars, some of which aren’t exactly being driven by the most competent of people and will tumble right into you. Plus, technically your whole gang is making the same escape, not just your racer, so you’ll often see your compatriots flying down the road next to you, some not quite as successful with their riding skills. 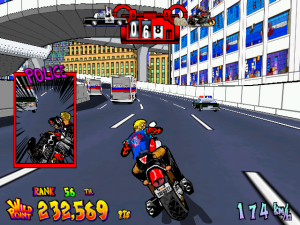 The downside to the visual overload is that it can actually be hard to see the road in the more chaotic moments. 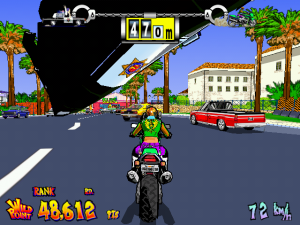 In a nice touch, time flows across the course of the game, even though at an obviously accelerated pace – the chase commences at dawn, and by the time you reach the final areas, the sky has transitioned to dusk, eventually hitting nighttime as you get to the sea. 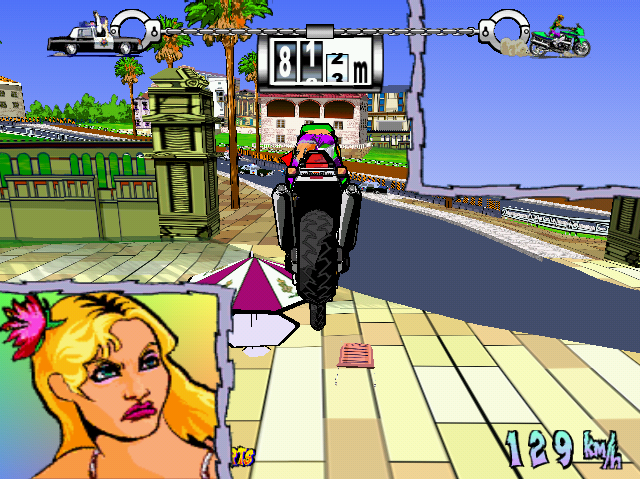 The action is accompanied by thematically appropriate heavy metal, singing in English something or other about “outlaws” – based on the credits, it doesn’t appear to have been licensed but rather composed by the development team. 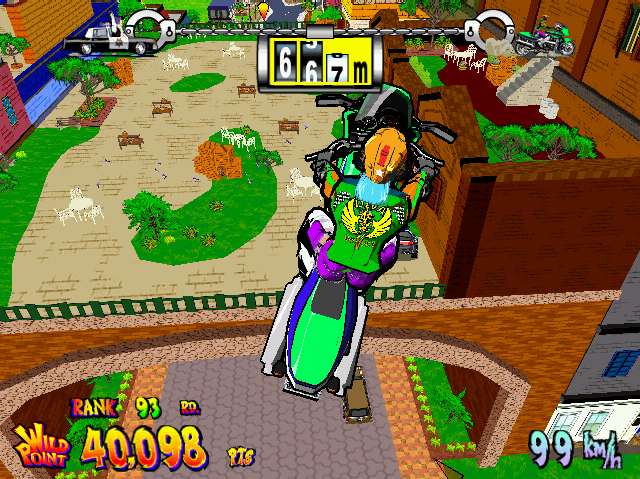 The game is more than just style, and there are some interesting change-ups to the racing game formula. 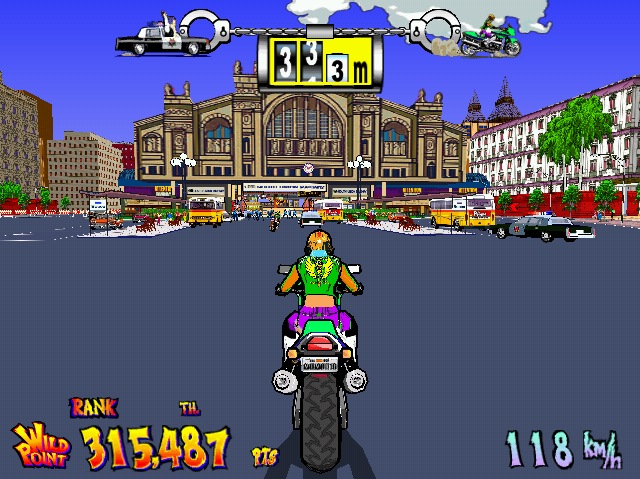 Given the constant threat on your tail, the typical racing game countdown timer works a little bit differently here, as it’s presented as the distance between you and the law. 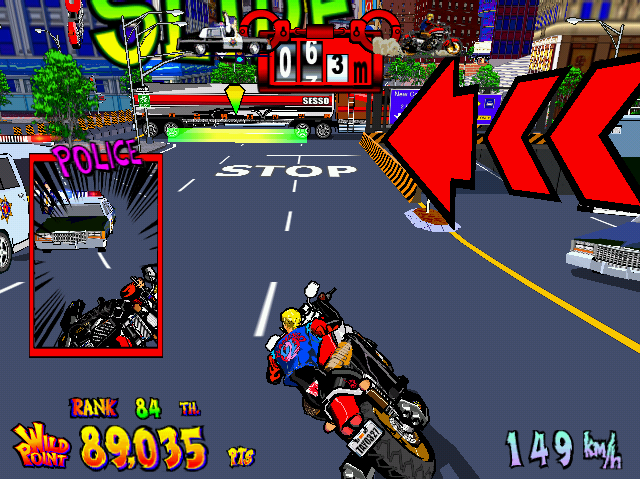 Obviously, if you keep crashing into stuff, you’ll slow down and put yourself closer to getting arrested. However, your position on the course also effects how quickly the police officers will close the gap. When you’re in sections where you’re just driving down the road, they’ll catch up pretty quickly, but in areas where there are less likely to be cops aggressively chasing you, like through the hotel, they’ll actually let up a bit and let you gain a bit of distance. 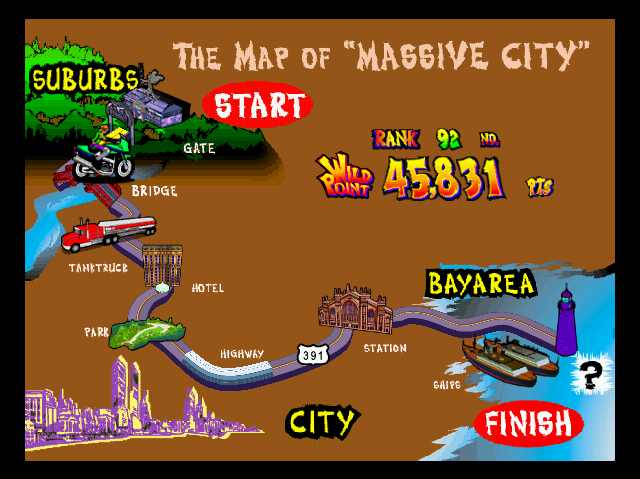 The spacing of these changes in flow don’t always make sense – somehow when you enter the highway section, you’ll be granted some extra breathing room even though it would seem like it would be easier to chase you there, but even then there’s some logic behind it, considering the many road blocks they have set up for you. 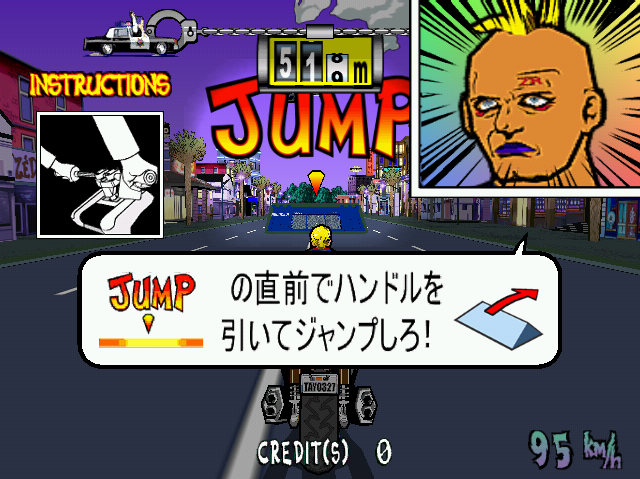 The course is peppered with several unavoidable obstacles and roadblocks. 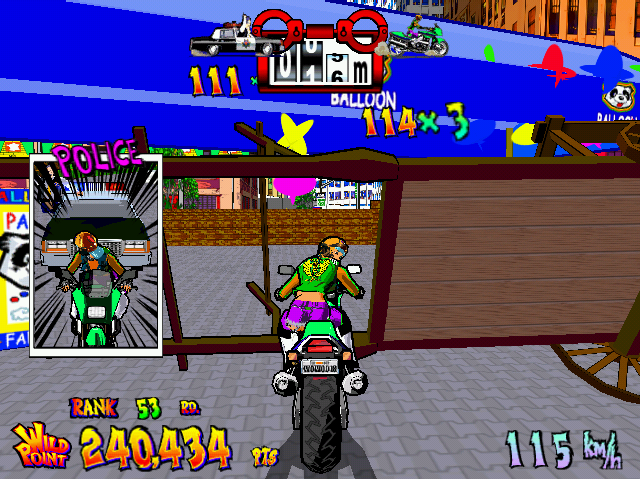 In order to make jumps, you need to pull up on the arcade cabinet’s handle bars; to slide underneath barricades, you need to push down. Depending on your timing, you’re graded after each of these, with the best reflexes granting both high scores and an extension to the chase countdown. 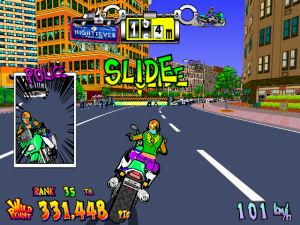 There is something wonky about the timing on these, though, especially noticeable in that you can get S ranks when sliding but still crash into a barrier. It is made to be a little loose considering the delay between pushing/pulling the handlebars and your character reacting. 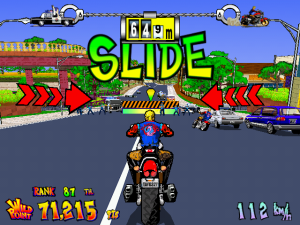 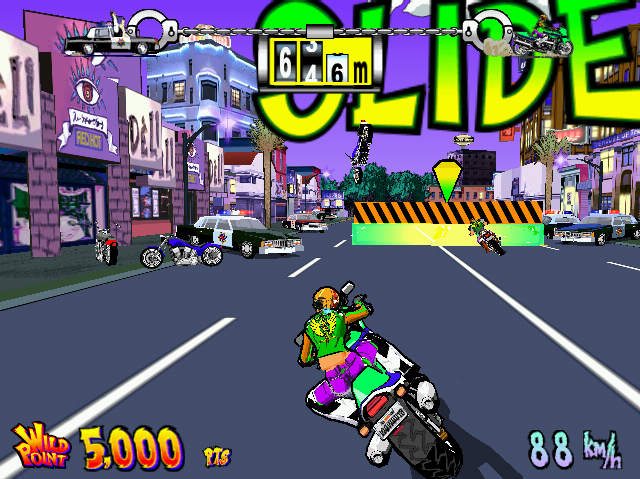 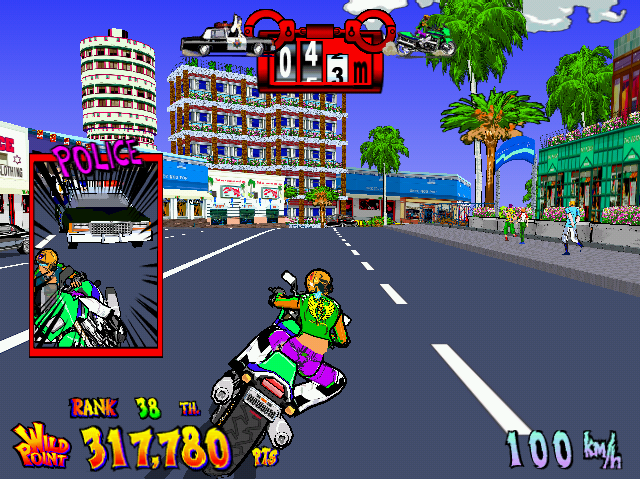 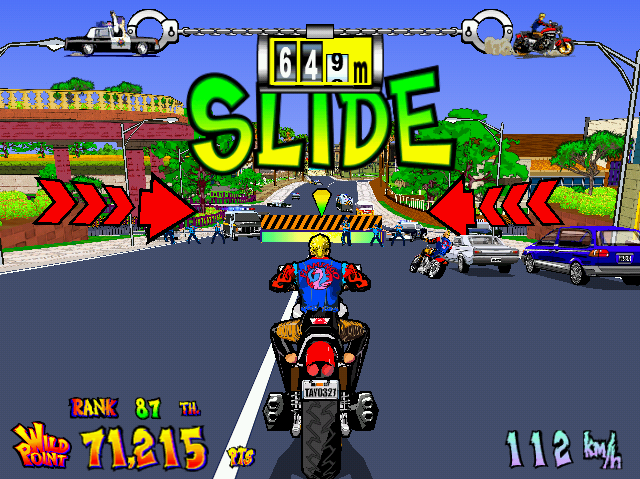 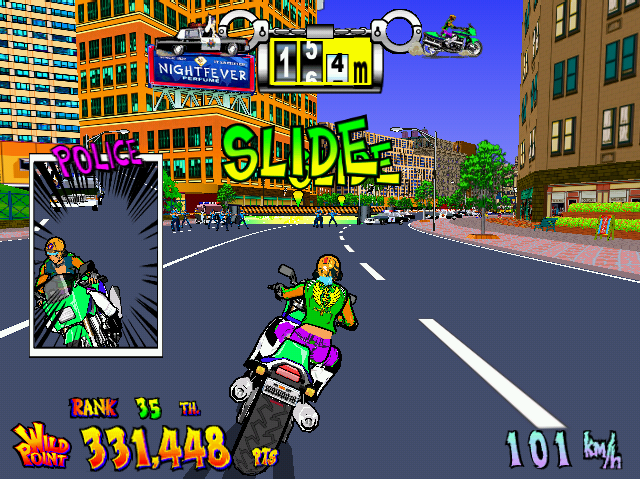 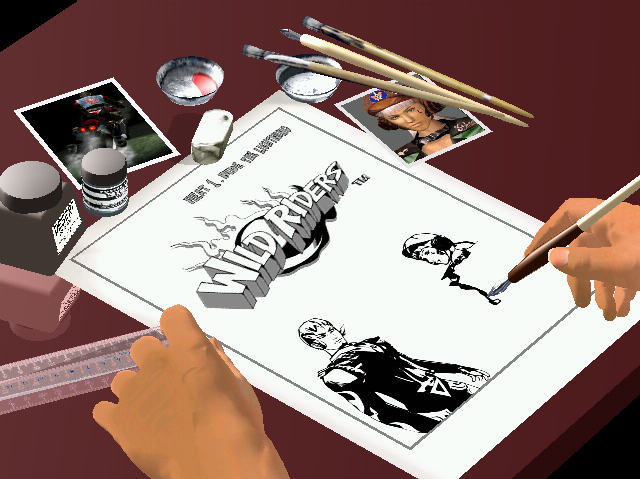 Wild Riders is one of those Sega arcades titles from the late 90s/early 2000s which has kind of fallen through the cracks of history by virtue of it never being ported, alongside stuff like SCUD Race, Top Skater, Ollie King, Brave Firefighters, and Planet Harriers. It runs on the Naomi 2 and the Xbox could’ve easily have handled it. 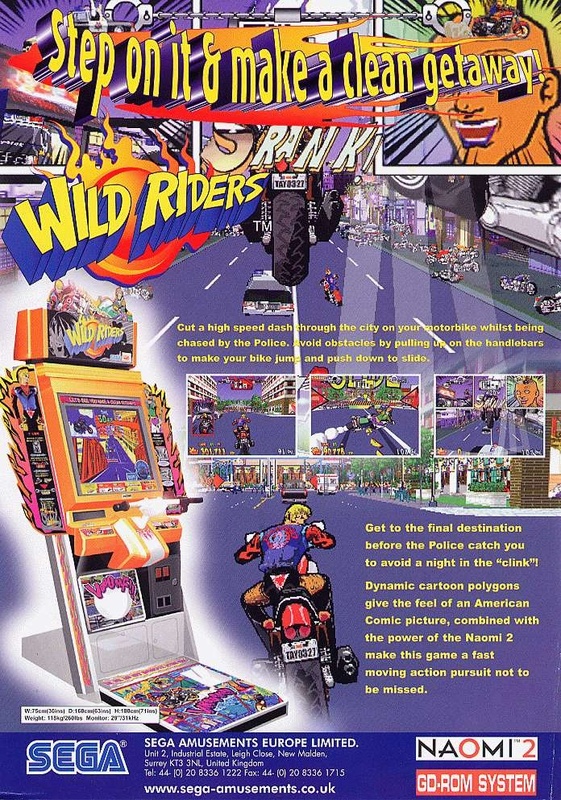 But like many of these other titles, it really is an arcade-title focusing on quick thrills first and foremost, especially seeing as the game is only about five minutes long. 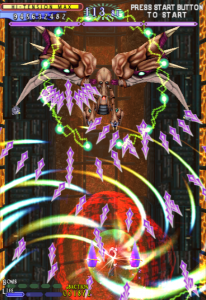 It’s challenging enough that it will probably take a few attempts to make it through, especially some of the tougher choke points, but once you’ve overcome that not-particularly-high barrier, then it becomes fairly trivial. In order for it to function as a console title, it would’ve needed something more – more courses, maybe some branching routes (there are a few hints of these in the game but no more than a few seconds), or some stronger scoring mechanics. 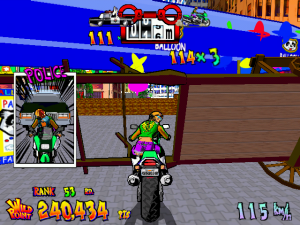 Beyond grading your jumps and sliders, the only other real way to increase points is by knocking into smaller items (traffic cones, beach chairs, etc.) 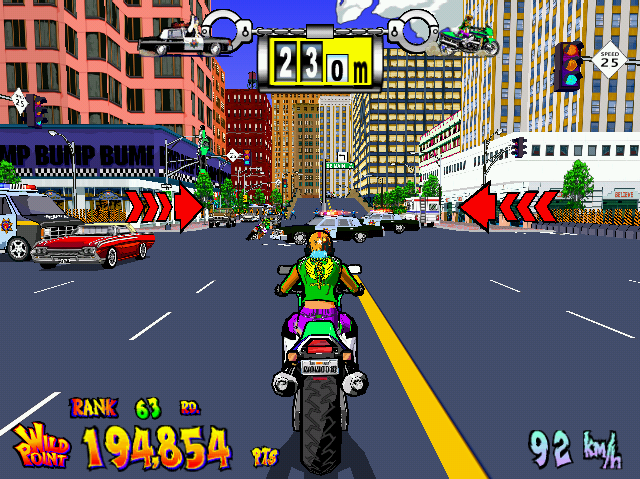 but it really feels like it could use something like Crazy Taxi, where driving onto incoming traffic or weaving closely to other vehicles bolsters your score. Despite being more or left forgotten among any number of amusement-style games, it really shouldn’t be. 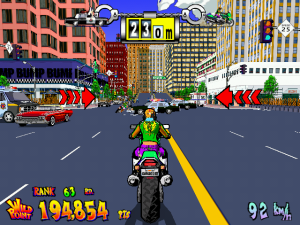 It’s the prime example of Sega’s visual style aging like wine, as the game’s as brilliant looking now as it was upon release, and perhaps even more impressive given the number of visually boring extreme arcade racers like the many The Fast and The Furious games that became far more popular in its wake. 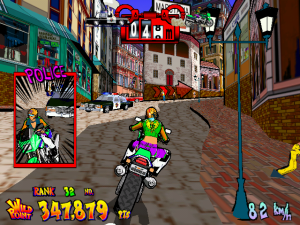 Emulating it still maintains most of its excitement, even though it’s missing the physical feel of the motorcycle handles, but it absolutely begs for some kind of port to get more people to appreciate its gorgeously cartoonish anarchy.